Let your teenager rediscover the great outdoors. 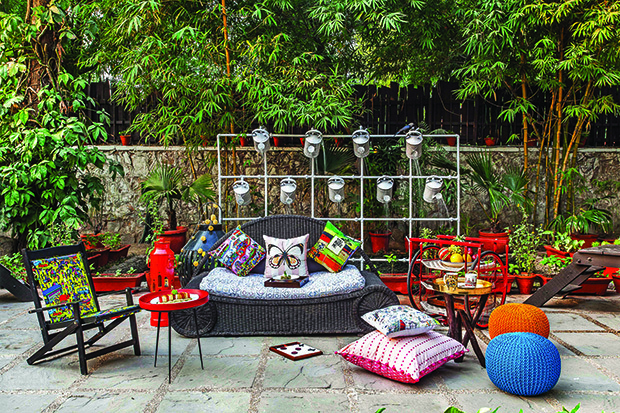 In this casual-chic party setting, we bridge the gap between the mundane and magical with whimsical lights and colourful design cues. 1 The humble folding chair gets a colourful makeover. Made from recycled wood, the fabric (cotton front and nylon back) is washable. 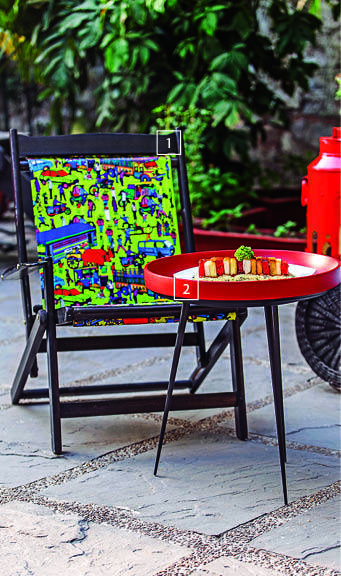 With an interesting print inspired by urban life, the chair’s quite the ice-breaker; ₹ 4,995; PLAY CLAN. 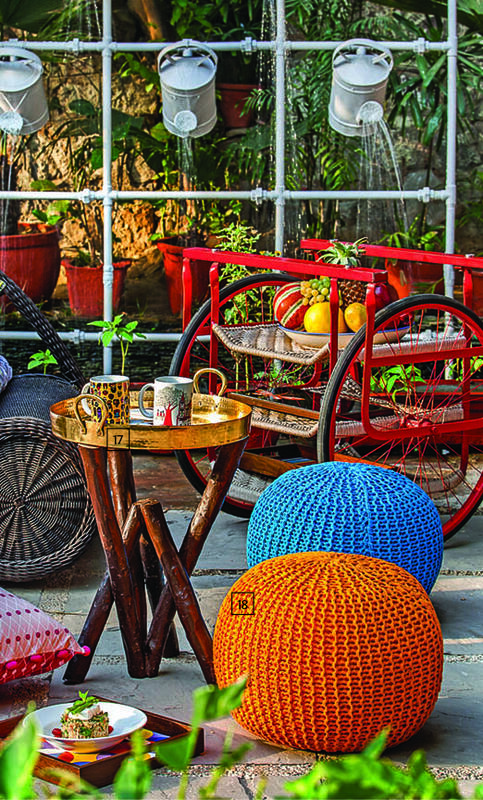 2 Complementing the chaotic colours in the chair, the striking red Anantaya table, has a wood top and metal legs; ₹ 11,305; SECOND FLOOR STUDIO. 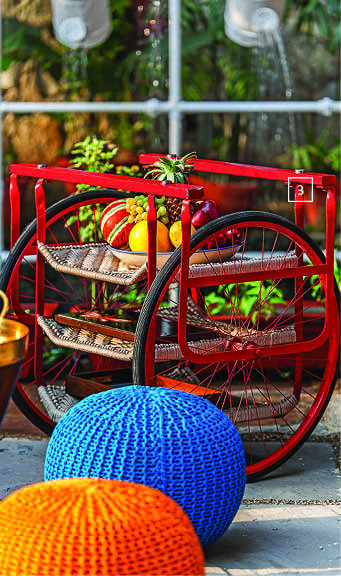 3 The Chalta Racket by Srishti Bajaj is a unique rack on wheels. 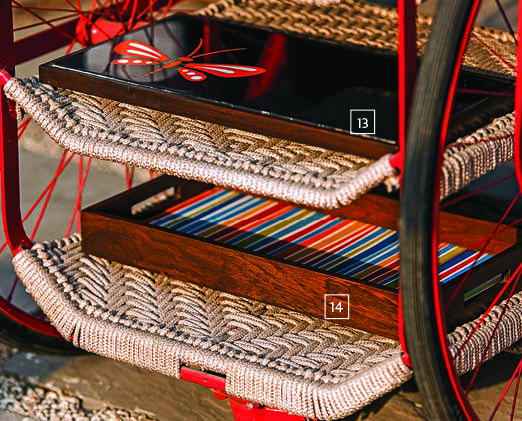 Inspired by the vernacular of the cart, it gets its name from colloquial Hindi slang which means ever moving. Made of natural coir and silk cord, it can swivel 360°, and thus offers superb portability and functionality; ₹ 42,649; DESIGNEMPORIA. 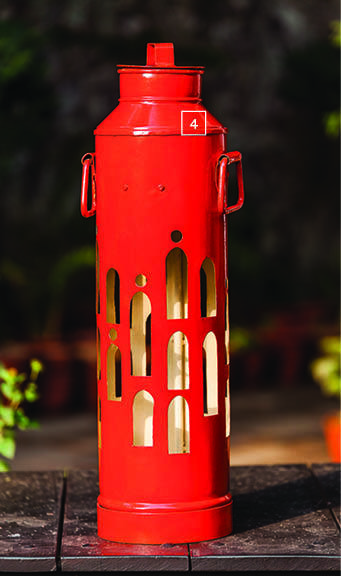 Milk Can Light has different jaalis in an arched shape. When illuminated, they cast interesting patterns; ₹ 9,500; DESIGNEMPORIA. 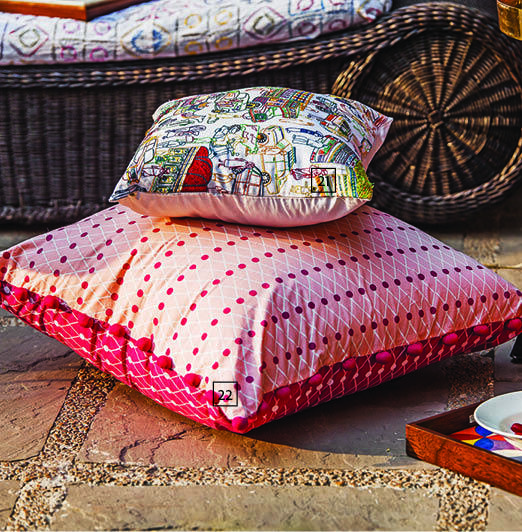 5 Brighten up any room with this digitally-printed cotton cushion cover; ₹ 1,195; PLAY CLAN. 6 Looking for animal attraction? 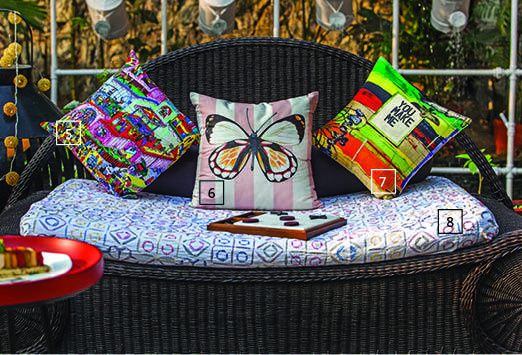 Get a hold of this hand-painted butterfly cushion whose front is cotton and back silk; ₹ 5,900; SECOND FLOOR STUDIO. 7 Designed by artist Trishala Jain, this printed cotton cushion cover adds a sense of whimsy to the space; ₹ 490; FABINDIA. 8 Simple yet chic, this cotton bed cover uses embroidery and applique work to create magic; ₹ 6,690; FABINDIA. 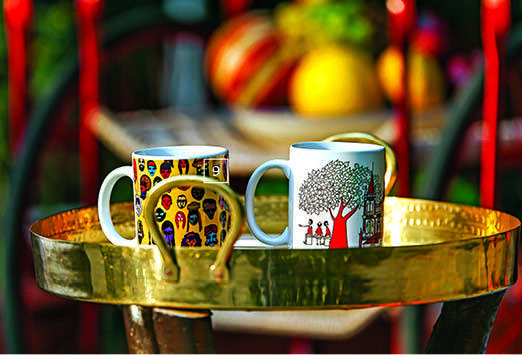 9 & 10 Sip hot chocolate in these colourful ceramic cups that are microwave-safe; ₹ 345 (each); PLAY CLAN. 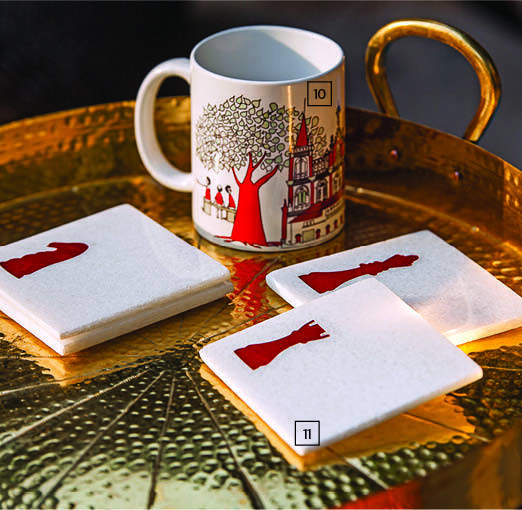 11 Aptly called The Cheeky Chessplayer, these hand-carved marble coasters have the ‘game of chess’ motifs in a red onyx inlay; ₹ 2,575 (set of four); AMALGAM. 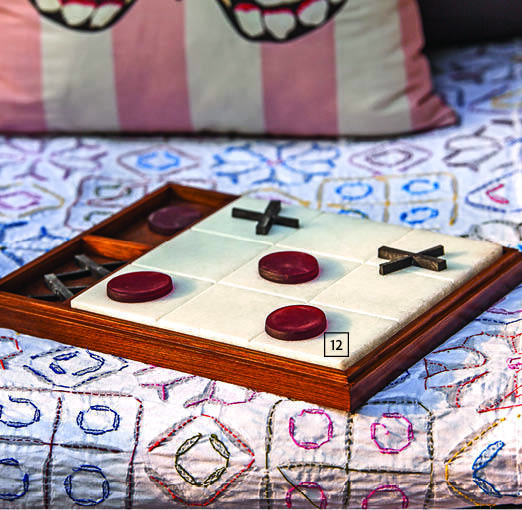 12 The handcrafted Knots and Crosses Set is made from Makrana stone, granite and red onyx; ₹ 6,250; AMALGAM. 13 Inlaid in orange and white into black Italian Marcino stone, the Daring Dragonfly platter adds boldness and colour to any party setting. The motif has been hand-carved; ₹ 3,100; AMALGAM. 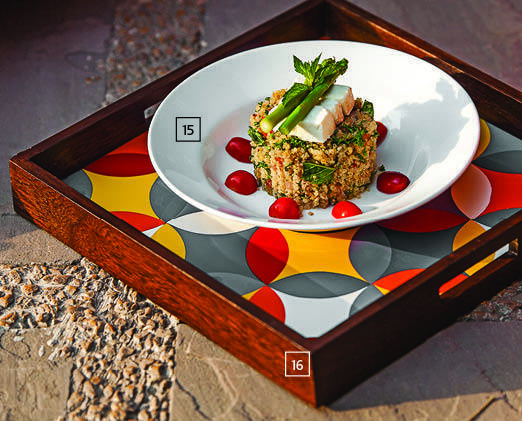 14 Get ready for stripe-tease with this coloured resin, hand-carved tray called Diagonally Yours; ₹ 2,500; AMALGAM. 15 Veggies and herbs create this lip-smacking summer food platter; Lodi – The Garden Restaurant. 16 Hand-carved circular motifs come together to form the Circling Clique tray. 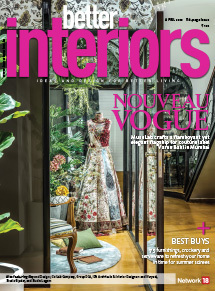 Don’t miss the unusual overlay of resin on wood, a definite highlight of this product; ₹ 2,500; AMALGAM. 17 Created by using waste wood and patal (a big pan) this side table also designed by Sahil and Sarthak, is accentuated by a traditional thali-like brass platter on top; ₹ 13,000; DESIGNEMPORIA. 18 Sit pretty on these knitted pouffes made from cotton threads; ₹ 3,500 (each); SECOND FLOOR STUDIO. 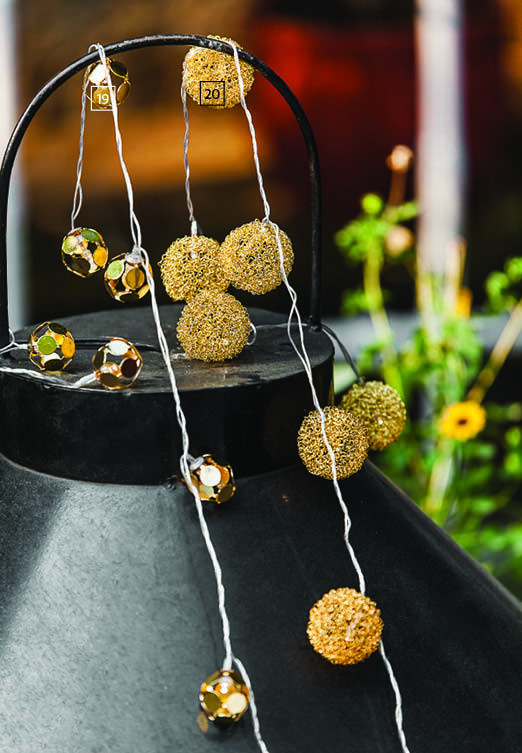 19 These iron string lights add a dash of gloss and glamour to the setting; ₹ 560; FABINDIA. 20 More string lights in iron, this time in a larger size; ₹ 760; FABINDIA. 22 Looking for pink perfection? Pick up this cotton floor cushion with graphic prints; ₹ 2,350; SECOND FLOOR STUDIO.